I love this pattern. It never lets me down. And there are times in life where working with something you can count on to work as designed, as promised, as you hope it will, as you expect it should, is to be celebrated. Sarai from Colette Patterns was coming to town, and thought it only right that I should wear a CP make to welcome her when she visited us at Stitch 56. I’d been wanting to make a Myrtle since it came out, so I picked my favourite Indian cotton from the shelf and set about making it. I’ll tell you more about what happened in another post, but all you need to know is that it didn’t fit, and I couldn’t wear it, so I didn’t finish it, and I was so frustrated and upset knowing I was running out of time to start a new project. That is, until I remembered the Sorbetto. 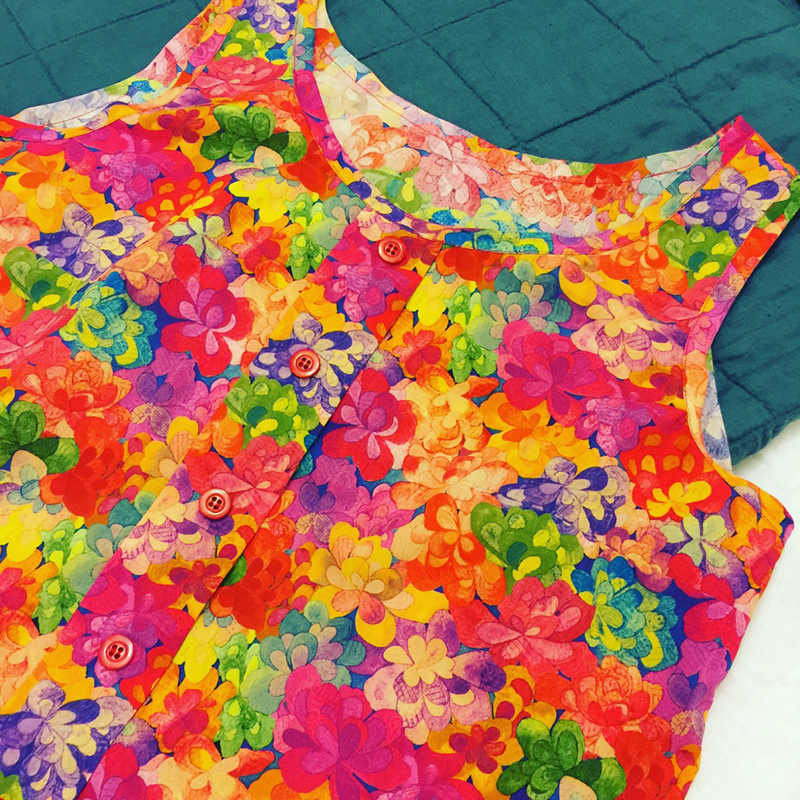 I picked the brightest print from the Liberty shelf, and with only one night to go before the event, I marched off home to sew up what is now one of my very favourite tops. I made my own bias binding, and added some buttons to the front, and it came out just perfect. The length is just right, with the hem sitting just on the hip, and the shaping in the cut of the side seams gives me a snug yet comfortable and flattering fit. The armhole is well-shaped with a lovely line at both back and front. I think some patterns get this curve wrong, making for an unattractive appearance, but the Sorbetto is spot on. I like the width at the shoulder, and being sleeveless and fitted, I feel it gives me a slender elegant look, and I always feel really good in this design. I used my new “toy” to fold the hem evenly all round. 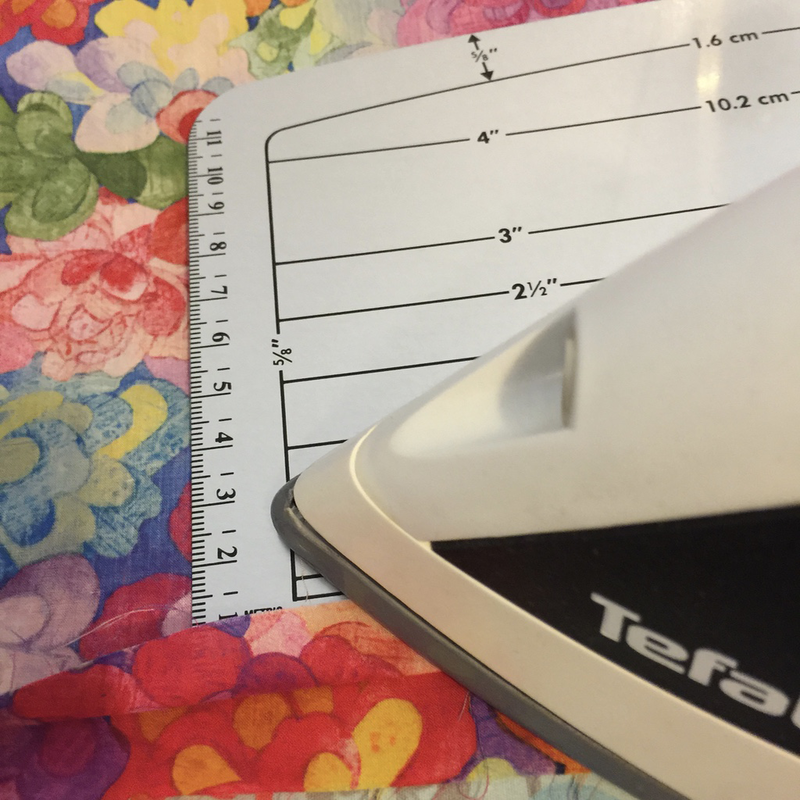 It’s a Dritz Ezy-Hem, and it makes this part of the make so quick and easy. I only wish I’d remembered to bring home some thermal thimbles so my poor fingers didn’t get burned by the steam coming off my iron! All in all, this was a very satisfying make, started and finished in one evening after work, and I’ll get heaps of wear out of it. Perfect.